Cook's Garden Favorite. French green bean par excellence. ‘Mascotte’ offers up a plentitude of round, extra fine, stringless 5” beans, the crisp flesh packed with flavor. Pods require only the simplest preparation: a little steaming, a little butter: bean bliss. Exceptionally productive, easily harvested, 20” dwarf plants are well-suited for windowboxes, pots, patios and the garden. GROWING TIP: Allow two to four days between each gathering. 50-55 days. 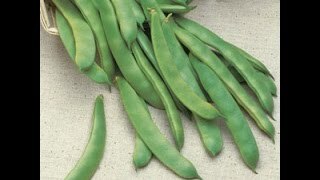 Beans are one of the easiest summer crops you can grow. We show you how to grow your own. 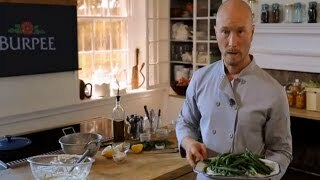 Chef Ian of the Farm Cooking School in Stockton New Jersey Prepares Green Beans with Green Goddness Herb Sauce. Because beans are members of the legume family of plants, they can benefit from an application of a soil inoculant designed for beans and peas, prior to planting. The inoculant will enable the plants to take nitrogen from the air to use as fertilizer, which can increase crop yield and quality. Sow in average soil in a sunny location after danger of frost and soil has warmed, from spring to early summer. Sow after the soil has warmed, as seeds may rot in cooler soils. Sow in rows 24 inches apart. Sow seeds 3 inches apart and cover with 1 inch of fine soil. Firm lightly and water gently. Seedlings emerge in 10-14 days depending on soil and weather conditions. Keep sowing bush bean seeds every 2 weeks for a constant supply of beans. Thin gradually to stand 12 inches apart when seedlings are 1-2 inches high. In dry weather, keep soil well-watered. Plants need about 1 inch of rain per week during the growing season. Use a rain gauge to check to see if you need to add water. It’s best to water with a drip or trickle system that delivers water at low pressure at the soil level. If you water with overhead sprinklers, water early in the day so the foliage has time to dry off before evening, to minimize disease problems. Keep the soil moist but not saturated. Cultivate or mulch to keep weed-free, but do not work or handle plants when leaves are wet. Beans as companion plants: Planted closely in rows spaced around two feet, bush bean plants blend well with like-sized warm-season vegetables such as peppers, tomatoes and eggplants. Between towers of pole bean plants, planting vines such as squash can help keep weeds down. Pole beans can help protect cool-season vegetables such as spinach and lettuces, as the weather warms. For dried bean use, harvest in about 80 days, when the pods start to dry on the plant. To Dry Beans: Allow the beans to stay on the plants until they are partially dry. Then pull up the plants and hang them in a warm, dry place with good air circulation until the pods and seeds are thoroughly dry. Shell the beans and save the pods and plants for composting. Bean, Mascotte is rated 4.3 out of 5 by 4. Rated 4 out of 5 by hobbiest from Great flavor and production - not drought tolerant Loved these beans, well worth the price but do keep them watered! Although they were fine in the heat, if it got too dry they were done and there was no going back. Produced way better beans than some others we tried though. Rated 4 out of 5 by Bobske from Tons of blossoms! Super productive, but almost too much so. Nice dilemma, right? How does one go about supporting the plants when they sag? Rated 5 out of 5 by smallfatdog from great for patio pots wonderful flavor and heavy harvest for such a dwarf plant. This is a bush type bean and so most of it's fruits mature simultaneously, however, I had a few good pods all season long which I grabbed off the plant and ate out of hand as I walked by. Rated 4 out of 5 by bobbie jo from So wonderful but so short lived. I had good luck initially with this product but it died out pretty quickly. But honestly I don't think it had anything to do with the product.. it was my blue thumb.. hahaha.. The beans that I did harvest were delicious! !